Discovering the entrepreneurial spirit! My ticket to getting involved in the world of education started with one, simple question: “How do we get more entrepreneurial spirit in this field?” My beginnings started with the Business@School Initiative at BCG. Years later, after having founded schools myself, I discovered NFTE (Network for Teaching Entrepreneurship), where I'm now a board member. This organization consists of a great group of people who do excellent work in training teachers how to open up entrepreneurial perspectives for young people, mostly in schools in socially difficult areas. In addition, NFTE also runs Biz Camps during the holidays, where students ages 14 to 17 develop business ideas and pitch them to an adult jury. 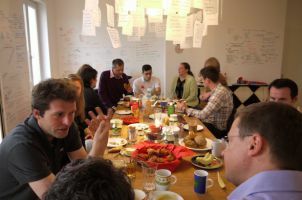 Here's an Interview with Kyra Prehn and Florian Schulz-Freywald of the German Network For Teaching Entrepreneurship about their recent BizCamp!